LONDON : New research from Strategy Analytics, the global analyst and consulting firm, quantifies the steady decline of analog television broadcasting and the progress towards so-called 'Analog Switch-Off'. The report, published to subscribers to the Broadband Entertainment Strategies service, shows that 597 million homes worldwide used analog terrestrial broadcasting as their primary TV service in 2002. With the growth of digital television services offered by satellite, cable and terrestrial operators, this number is forecast to decline by 24 per cent to 455 million by 2008. 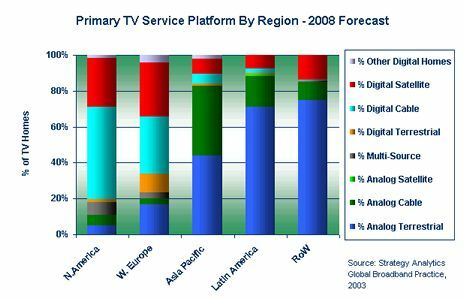 North America and Europe will be the most advanced markets in the digital TV transition by 2008, but the majority of homes in the rest of the world will still use analog terrestrial TV as their primary service. Even in the most advanced markets, however, a realistic analog switch-off strategy will have to account for the additional costs of converting hundreds of millions of secondary TV sets and VCRs. Analog switch-off is seen as a key policy goal by most governments. Releasing this valuable spectrum could ultimately lead to major new commercial and public revenue opportunities. The report suggests that few, if any, countries will be 100 per cent digital until well into the next decade. Some countries, such as Germany, will instead seek to use analog platforms such as cable as an alternative to terrestrial broadcasting. The report recommends that broadcasters relying strongly or wholly on analog terrestrial broadcasting for access to viewers must consider implementing alternative strategies and distribution partnerships in order to safeguard their long term position.